In the world of wine, people talk about passion but often in a superficial way, without the right emotional investment that an excellent wine deserves. Instead, I’d like to define, MEA CULPA as fascinating, original, and why not, a bit of a rebel. This red wine and its richness is the final result of many people’s work, from vineyard workers, wine markers, and cellarmen. In different extraordinary places in the South of Italy, people have contributed in creating a synergy of tastes, aromas, and sensations that are proudly contained in every single bottle of MEA CULPA. Originality and heresy derive from my aspiration to combine the excellence of two Italian regions: Puglia and Sicily. The aim is to maintain an intriguing balance of power and elegance created from different grapes. 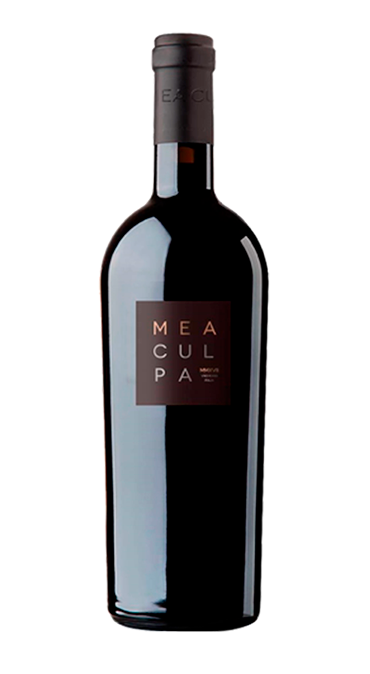 In general, I do not like to highlight or emphasize a certain wine, but I am proud to say that MEA CULPA is the result of a lot of work; from the respect for the grapes during their cultivation to harvest, drying and where necessary, the vinification and refinement with discreet and elegant woods. MEA CULPA surprises you with its almost meaty structure, which combines a natural softness with velvety tannins and a persuasive persistence. I dare you to serve it slightly chilled.